ARLINGTON, Texas – 2017 World Champion and world No. 1 bull rider Jess Lockwood winced in pain while PBR Sports Medicine director Rich Blyn adjusted the sling in which Lockwood’s left arm rested. 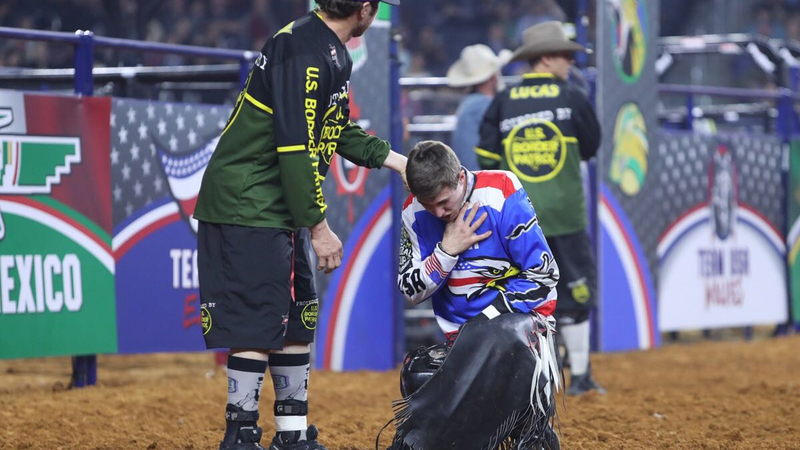 Lockwood had just broken his collarbone 30 minutes earlier attempting to ride Wild Goose during Round 1 of the WinStar World Casino & Resort Global Cup USA, presented by Monster Energy. The 21-year-old was disgusted with himself as he talked about the ride attempt that went wrong and knocked him out of the competition, and potentially for the next few weeks as well. Wild Goose came hopping out of the chutes and eventually lunged forward to rocket Lockwood forward, connecting the world leader’s left collarbone with his horn. It was apparent right away to those on the back of the chutes that Lockwood likely broke his collarbone, which Dr. Tandy Freeman later confirmed. “He didn’t have his day, but I didn’t either, and he got the best of me,” Lockwood said. “He kind of reared up and wasn’t his usual self and shot ahead, just a freaking 50-foot, and jerked me down. Lockwood will now meet with Freeman in Dallas on Monday and get X-rays to determine the extent of his injuries and if surgery will be necessary. The Volborg, Montana, bull rider has a 967.5-point lead on No. 2 Joao Ricardo Vieira in the world standings. Team Australia’s Nathan Burtenshaw broke his collarbone last season, and is out once again with a broken collarbone, and missed 46 days following surgery. 2016 World Champion and fellow Team USA Eagle Cooper Davis broke his in 2016 and only missed two weeks. Lockwood’s injury means that five-time PRCA champion Sage Kimzey will be in the draw for the Eagles on Sunday afternoon. Fans can watch the conclusion of the Global Cup USA exclusively on RidePass beginning at 1:30 p.m. ET. The Eagles (4-for-9) are sitting in second place in Arlington, but they are three rides (345.25 points) behind event leader Team Brazil. Kimzey was not in attendance Saturday night as he was competing at the Fort Worth Stock Show & Rodeo where he finished in fifth place. “I hate that Jess is out,” Kimzey said via text message. “I have big shoes to fill coming in first for J.B. (Mauney). Now Jess. All I know is I will give 100 percent effort for not only myself, but this team and country that I love dearly. Two-time World Champion and Team USA Eagles coach Justin McBride made headlines earlier this week when he named Kimzey as an injury replacement for two-time World Champion J.B. Mauney (broken leg). McBride said on Saturday night this was the scenario he was fearful of and why he wanted Kimzey in his back pocket for Sunday. Team Captain Davis said he knows the Eagles can count on Kimzey, and Davis did all he could Saturday night to keep the red, white and blue within striking distance of Brazil. Davis rode Arctic Assassin in Round 1 for 85.75 points before coming back with an emphatic 89.5 points on Hard & Fast. Davis is leading the race for the individual event aggregate championship with 175.25 points. He is 4.75 points ahead of Eduardo Aparecido, the only other rider to cover two bulls Saturday night. The Jasper, Texas, cowboy made it a point to acknowledge the fans in the crowd following his Bonus Round ride. Fellow Texan Cody Teel helped get the Eagles started in Round 1 with 89 points aboard Stunt Man Ray. That was good enough to give Teel the Round 1 victory. Coleman was giving Teel quite the pep talk before he climbed into the bucking chute. Teel – the 2012 PRCA champion – and fellow USA Eagle Brennon Eldred used to rodeo with Kimzey before switching over to the PBR full time. Eldred rode Big City for 86 points in Round 1 for the only other qualified ride for the Eagles. “That was damn sure wild from as soon as I crawled down in the chute until I got off,” Eldred said. “I’ve been on that bull, that’s the third time, and he bucked me off the first two times. That’s a good bull of J.W.’s. He’s a little bitty, not very big, but he’s got an attitude and he gives it his all every time. I knew I had him tonight. The two former National Finals Rodeo qualifiers expressed their faith in Kimzey being able to help the team on Sunday too.